Lillian Liu is a pianist who has obtained her Master’s degree in performance at the Royal College of Music in London under the tutelage of Nigel Clayton and Edna Stern, her Bachelor’s degree in performance at the University of British Columbia under Dr. Corey Hamm and Ryo Yanagitani, and is an alumnus of the Vancouver Academy of Music under Lorraine Ambrose for the Royal Conservatory of Music ARCT diploma. She is also a former student of pianist Connie Shih. Lillian is a recipient of the Mildred Johnson scholarship. 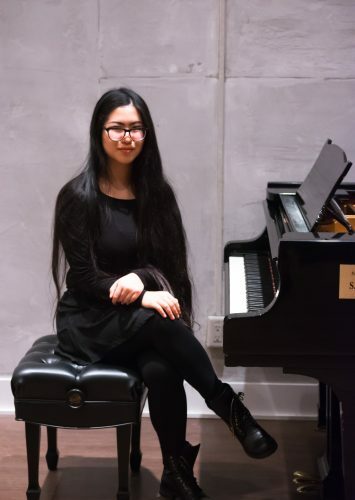 Apart from VAM, Lillian is also on faculty at the Semiahmoo Academy of Music and the Langley Community School of Music for piano and also violin, having studied the string instrument under Patricia Shih, Anne Shih, Taras Gabora, and Nikita Progrebnoy. Trained in piano pedagogy by Alice Enns and in Alexander Technique by Peter Buckocke, she has worked in environments with a wide range of student ages- from children and early music education such as with the Redbridge Music Service in London and in her respective musical institutions, to senior dementia and stroke patients in Chelsea and Westminster Hospital for CW+’s Memory Lane initiative designed for cognitive healing. Lillian is also an enthusiastic collaborative pianist in a wide array of genres- from performing in traditional orchestral and chamber music settings, to being in live film orchestra pits, to using ring modulated piano techniques with electroacoustic composers, to session work for recording artists ranging in genres anywhere between black metal in Iceland to folk music in Cascadia. Lillian is also an active festival and competition collaborative pianist with string players and vocalists, and has also performed both solo and with ensemble in Europe and Canada, and also for organizations such as the Concordia Foundation. To fuel her artistic pursuits and inspirations in other ways, Lillian Liu is also a published creative photographer- as seen in publications such as Vogue Italia, Ellements, and many more. Her photography has brought her to over 20 global cities, and she will be hosting her first public workshop in Paris come spring 2017. Lillian is also experienced as a model, and has been published on newsstand magazines such as Gazelle in Francophone countries, and in print magazines such as Elegant.